The Amazing World of Gumball is no stranger to videogame, anime, and pop culture references. These are common story beats used in other past and current shows. But for the love of everything, please watch the episode, “The Console.” It’s a Final Fantasy and RPG tribute that’s too brilliant to be ignored. Creator Ben Bocquelet’s Cartoon Network series, which premiered in 2011, is centered around the daily life of a pre-teen cat named Gumball Watterson and his family. Gumball’s family is far from normal. His rational breadwinner cat mother, Nicole, is the polar opposite to his dim-witted stay-at-home father and giant pink rabbit, Richard. His brainiac younger sister, Anais, is a rabbit, too. And their brother, Darwin, was once a family pet goldfish who grew legs and gained cognitive intelligence. Many episodes use its characters to relay sci-fi, horror, drama, comedy, anime, and videogame tribute stories. While “The Console” may not be the first episode that tackled games—there was Season 2's “The Phone,” which incorporated a Spaces Invaders attack on the Wattersons because Gumball pissed off his alien classmate—it’s one of the best. “The Console,” which aired earlier this year, begins with Richard giving Gumball a retro Game Child system. Gumball shrieks in excitement until he realizes it’s clearly a knock-off made in a country that doesn’t exist. In an acute observation about the nonsensical naming conventions for RPG titles, Gumball bashes the game, Inverted Paradox: The Enemy Within, accompanying his fake system. The obvious nod here to Final Fantasy VII’s logo is fantastic as is Gumball’s rapid fire commentary that follows. He likens his game’s name to a fashion-challenged person who throws everything on with no common theme—another nonchalant burn on how RPG characters are usually dressed. The episode continues with Gumball, Darwin and Anais trapped in an Elmore that’s been sucked in and transformed into the Inverted Paradox game world. 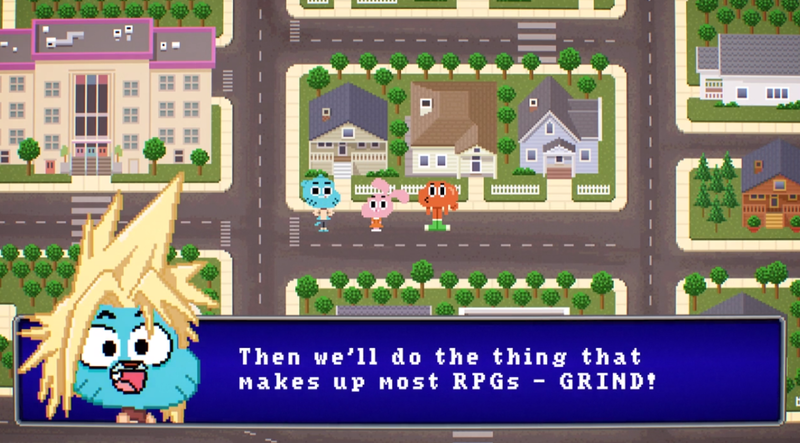 As the main playable characters, they head into town to figure out what’s going on, but not before Gumball takes the opportunity to cheekily name his character. I’m sure some of you can identify with the need to give your characters crude names with the sole purpose of having NPCs’ dialogues become extra ridiculous when addressing you. Gumball’s not above that silliness either. Before they’re able to leave their yard, the group encounters a shrub blocking their path. The show launches into a series of jokes as the trio tries to get around the obstacle, which eventually triggers a battle. Of course, the simple bush animation transitions into something much more dangerous looking and a fantastic turn-based fight begins. It’s a fight that has over-the-top special attacks backed by a terrible version of Final Fantasy VII’s battle music. It ends, as many Final Fantasy battles do, with victory fanfare poses for the group. From there, the expected genre tropes are explored. Gumball and crew loot an NPC’s house with (supposedly) no consequences while questioning the morality of engaging in criminal activity. In another scene, the group discusses the implied inappropriateness of an alternative costume for its female character and a justification for its use. Their adventure continued with the group addressing many things: The stupidity of over-sized weapons and their design. 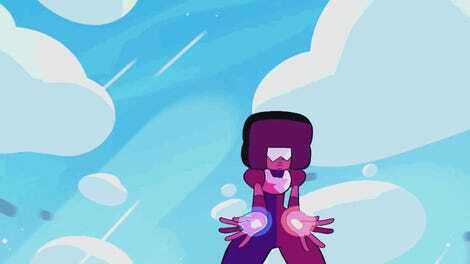 Summons. The horrors of meaningless collection quests. Cutscenes. A plot twist! Save points. Basically, if you’ve played any RPG, you’ll recognize all the pointed jokes Gumball tosses in the episode. It all culminates with the Inverted Paradox’s final boss fight which Final Fantasy VII fans would get a kick out of. It’s a spectacular display of comedy and Gumball’s own unique brand of strangeness that’s a fitting end. What I love about “The Console” are the tiny details scattered throughout the episode. As NPCs, Darwin’s and Anaise’s resting animations have small movement ticks. They’re never still even when standing in one spot, which is something lots of older RPGs and games in general, like Street Fighter, do. When scenes change, the screen fades out to a pixelated mess. The enemy attacks reducing the party’s HP to 1 was a nice touch. Being Gumball, the characters break the fourth wall of their video game conundrum by interacting with the text boxes in some funny ways. There are so many Final Fantasy, Final Fantasy VII, and RPG nods packed into The Amazing World of Gumball’s 11 minute episode that it’s staggering. While “The Console” also touches on some tired jokes that makes fun of perceived, unflattering lifestyles of the gaming community, its overall execution is crafted with gaming knowledge and feels like a love letter to the genre. The Amazing World of Gumball airs on Cartoon Network, and is available on Amazon. More Games and Anime. In Your Cartoons.